Who wants to win some Cedar Fair swag? I wrote on the front page yesterday that, in addition to the giveaways we are doing there, I would be offering some bonus prizes over here on the Discussion Forum. So let's kick that off with a prize pack from Cedar Fair theme parks! 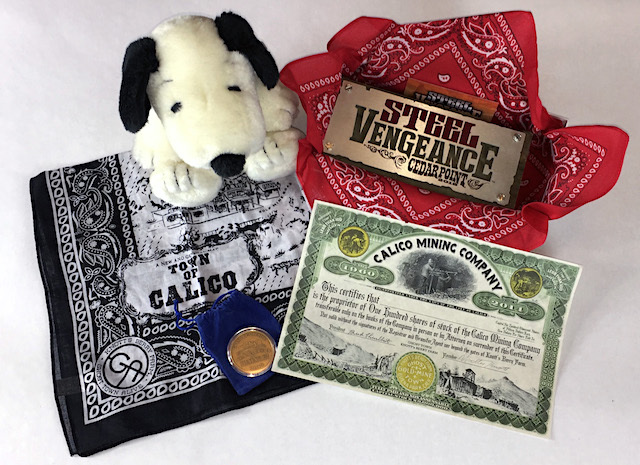 We've got a certificate from Knott's Berry Farm for 100 shares of its fictional Calico Mine Company, along with a commemorative coin from the reopening of the Caico Mine Ride and a Town of Calico bandanna. From Cedar Point, we have a piece of the track from the former Mean Streak, now known as Steel Vengeance. And of course, because it's Cedar Fair, we have a plush Snoopy, too. The rules are explained in full here. You must be a registered member of the site, logged in, and subscribed to our email newsletter using the same email address as you used to register. If so, if you are 18 or older and a resident of the United States, you can reply to this thread to enter. One entry per person. But I will give a bonus entry to the best response that includes an anecdote about visiting a Cedar Fair theme park, at my sole discretion. Even though discussions remain open for 60 days, I will use the same one-week deadline as we are using on the front page. So you must respond by Sept. 6 to be eligible. I'd love to win this. We did Cedar Point in May. I got 3 glorious rides on Steel Vengeance. My best anecdote is from my first ride on SV...and I'll keep it PG rated. With my upper body physique combined with the airtime and G forces on this ride, I was nearly out of my shirt and supporting undergarment! Ended up tucking my shirt into my shorts to keep myself appropriately dressed at the end of the other 2 rides! It was an uplifting and wild ride to say the least! Knott's Berry Farm is my home park! Been enjoying Ghost Town Alive, Beach Blanket Beagle, and talking to wood craftsman Bob Weir this summer. Also got a chance to visit the Charles Schulz museum in Santa Rosa in early August. EDIT: Just saw the instructions about leaving an anecdote. I had just gotten off GhostRider, maybe three or four years ago, before the recent refurbishment, when the roller coaster was bone-shakingly rough. I was standing near the load building taking photos of the coaster. A couple of teenagers got off the ride, and met the parents (about my age or in their 50s). The son, maybe about 16 or 17, says, "Dad, you would SERIOUSLY die if you went in that ride." Well sure! Nothing like Knott's Berry Farm. I love the Boysenberry Event, the park, and Krazy Kirk & the Hillbillies. I've been going to Knott's Ghostown when it was free to get in. At the John Wayne Theater I saw Rick Nelson & the Stone Canyon Band & Paul Revere and the Raiders. Back then they had top name entertainment during the summer. Oh yah Camp Snoopy and when they had Berry Tails, too. Great Fun. I have been to two of the Cedar Fair parks! My best memory is meeting TPI's own James Kohel and getting a really fantastic little tour of Cedar Point and its history in the area and in the theme park world! I never knew that it has been a destination since the mid 1800! I also was gifted a chocolate treat known as a Buckeye! That is a great collection. I love commemorative stock certificates and coins and I don't have those, yet. Fun to collect and usually reasonably affordable. Love that Knott's has become more of a family park. Still not too much to get in and to get an annual pass. The changes they have made in the last few years have made it much more fun, too. Good things have been happening there. This is so cool! I grew up going to CP, and now I live in San Diego, so I do Knott’s Scary Farm a lot here. Cedar Point will always be my favorite park, last time I went I got on Millenium Force 6X and just made it on Steel Venegeance right before closing. I think my favorite story is when I slept through my alarm on senior skip day and my friends left for CP without me. My mom (who is the best!) drove me 3 hours and dropped me off. Then, it rained around 5pm, and all of us got a bunch of hotel rooms at the Holiday Inn and had a hotel party before coming back in the morning. I have so many memories there, and so many more stories but I think that was the most epic! This looks so cool! The last time I was at a Cedar Fair park was Knott's Berry Farm when I was in elementary school. This was before the refurbishment of Ghost Rider, Calico Mine Train, and Timber Mountain Log Ride. My favorite memory from that trip was the Fool's Gold Stunt Show. My Dad is not a ride person, but this was something that he really wanted to see this show and it was one of his favorite things from the trip and it made me happy to see him have so much fun! Jim Koehl can confirm that this actually happened. After getting off of Mean Streak the last time I rode, I told Jim that I wasn't ever going on that coaster again until RMC came in and fixed it. Nine months later we found out that RMC had signed a contract with Cedar Point, but we still had no confirmation until nearly a year after that once the RMC trucks showed up. This year while I was minding the kids and waiting for my wife to get done with her ride on Steel Vengence, the kids and I decided to ride the train starting from the main station near the final turnaround for Millenium Force. We were the first ones in line and while we waited and I tried to keep a two-year-old and a six-year-old entertained, the ride op brought over an engineer's hat, pin (Junior Engineer with Snoopy on it), and train whistle for both boys. She then gave out swag to several of the other kids standing in line. I was very impressed with this freewheeling giving. After the first leg of the ride, the timing turned out so perfect that we actually saw my wife exiting the ride as the train was pulling out of the station at the back of the park. Spent my 1st morning in Minnesota, today in fact, at Valley Fair. We have only been to Knott's Berry Farm once with our kids, but that one time was a doozy! First ride, Ghostrider, sitting in the front 2 rows. None of us were prepared for how fast or vertical that coaster would go! I reality, it is much tamer than MANY other coasters we have ridden, but we simply didn't expect much. Never screamed so loud on a roller coaster before or since!!! I do love snoopy, so yes please. I remember showing up to CP this summer and having to kill time until our friends arrived and we would all ride SV. We rode Gemini to get the side credit we hadn’t gotten. After getting off we had about an hour left. We decided to ride Dragster and proceeded to go through the 45 minute line. As we boarded our train our friends sat down in the stands to watch. We locked in and rolled out. We boarded in the second load so we were behind the other train. After almost five minutes. The rolled is backwards into the station. They then in loaded us, and switched the train off track and put h other on. We got on again, and then the rolled us back again. Finally after that reset we launched out and went from zero to 120 in 3.8 seconds. We got off and headed back to SV and I rode my 100th coaster on a very memorable night. Knotts has been my home park for my entire life and I've seen it go through a lot of changes. When Ghost Town Alive was announced I wasn't sure how I felt but seeing it go on blew my mind. It was once of the most immersive and incredible theme park experience I'd seen and I just loved it. Calico is my all time favorite theme park "land" and so to see it with so much life made me feel like a kid again. Been going to Cedar Point since I was a kid! Went this last May but didn't get the chance to ride Steel Vengeance. Oh well! Bring back Disaster Transport!!! Thanks for entering, everyone! Contest is closed and I have emailed the winner. Congratulations to our winner, susankowalski!